UPDATE: 2019 Has not been announced yet. It tends to drop in mid Ausgut though so stay tuned. LAST YEAR: Friday, August 17th, 2018 subscribe for more info. Tickets go on sale at 10am on Saturday, July 21st at the downtown store. Tickets were $30 and sold out last year. Store located at 494 9th Street. You can also buy other Oaklandish merchandise there. Good luck and expect really long lines the night of the event. 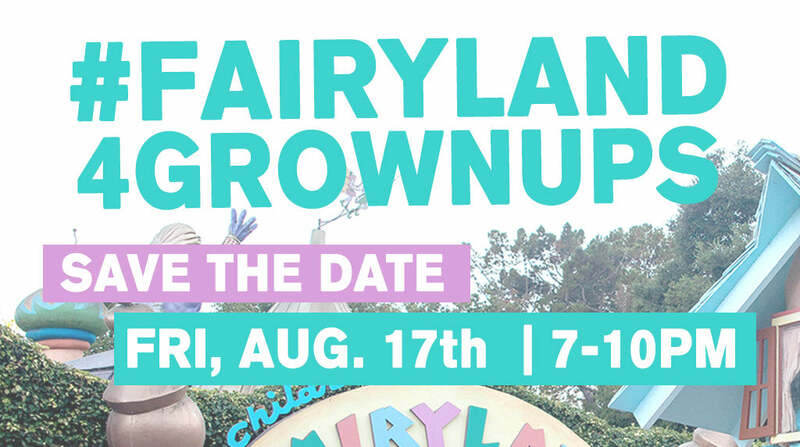 Here we are in our 8th year of Fairyland for Grownups sponsored by the Oakland t-shirt company Oaklandish. As someone who was born in Oakland and grew up going to Fairyland as a kid, I must say I am not impressed. I went the first 2 years, but no more. Super downhill from the first year even. Oaklandish’s Fairyland for Grownups is more of an overpriced, overcrowded and under bartended dance club with long drink lines and poor music. Yeah, I said it. I don’t know what it will be like this year other than tickets are now $30 and it will surely sell out due to new age Oakland transplant hype. While I have very fond memories growing up going to Children’s Fairyland with my dad and my sister, I can tell you it is no place for an adult. It’s just not the same or even fun. I have even snuck in as an adult, it’s really easy. Ask anyone on the way in with a kid if you can join them to get past the booth and you’re in. A friend and I did this. She asked the lady, we went in with her and her kid, then explored memory lane as a grown up. You’ll start getting thoughts like “Wow, I remembered it being bigger….” and “Has it always been this ghetto?” or “How could my parents stand taking me here?”. During Oaklandish’s Adult Fairyland Night for Grownups pretty much most of Fairyland is closed down and you can only stand around in long long drink and food lines or a crowded dance floor. Luckily it’s only 3 hours so you won’t be subject to pretending you love it for very long. If you do go you should sneak in a flask because the long lines for small plastic cups of free beer will take up most of your evening. You’ll also find that when you go during daylight hours you’ll want to leave after like 20 minutes when you’ve seen it all. You really don’t even have to borrow a strangers kid, ask a friend or a neighbor with a kid if they want to go to Fairyland. Make their day, realize you’re an adult now and you just signed up for torture. But the kids will love it. People, Fairyland is for kids. You either grew up here and got to go or you didn’t. Paying $30 for tickets to drink in an overcrowded kids playground is just ridiculous. If you really want to have a great grown up time on Lake Merritt, grab a few friends, a bottle whatever and walk around the lake. Sit in a park, climb a tree, chill at the cascade, whatever. It’ll be way more fun with your friends, not to mention cheaper. The one plus is they do say this is a benefit so there’s that at least. Beer, Wine, Food, Trucks, etc. Please get in touch if you have extra tickets to Fairyland this Friday night! Thanks! Hey! Leave it to Oaklandmofo to provide the only real info on the Internet on adult night at fairyland ? Is there gonna be another one in 2018? I somehow never replied to this or maybe I just messaged you on FB instead. They just announced the date for 2018.